It seems that the trend back in time doesn’t stop with the undercut hairstyle or the Mad Men inspired suits, but also extends to the bar. You may have noticed that your local watering hole has recently expanded it’s collection of whiskey as the liquor makes a comeback. As connoisseurs elbow towards the bar, you may be faced with decisions that seem unfamiliar to you – Irish whiskey, American whiskey (aka bourbon) and modern artisanal versions and…a cocktail for the lady? You may recall your Granddad pouring his whiskey neat from a crystal decanter, but that’s not the only way to take your whiskey. While purists drink theirs neat, it’s no longer frowned upon to get a little inventive. Think of the classics that would have been in the hands of Winston Churchill, Clark Gable and Sinatra, like the Manhattan or Whiskey Sour. According to experts, the trick with whiskey is to enhance the flavor rather than mixing ruthlessly into it and even the most creative mixologists are still sticking to variations of the classic Manhattan. To help you get ready to shoulder up to the bar yourself, here are some rules on imbibing in a little whiskey on your own. Bartenders and hosts across the nation serve whiskey in almost any type of glass these days — you can drink whiskey out of anything from a Mason jar to a coupe glass. But the only glass a whiskey drinker really needs is a big tumbler with a nice heavy base. Chill out on all the paraphernalia — a good whiskey doesn’t need fancy ice spheres or whiskey stones or artisanal bitters or $20 by the jar cherries to dress it up. Like a good haircut — or a perfectly maintained beard — a good whiskey should stand on its own. Try your drink neat at first to get the true flavor. After that, feel free to drink it however you enjoy best. Many will add a dash of water to smooth out the taste, and others prefer their whiskey over ice. Take your time to select the perfect delivery system. Remember that older isn’t always better. 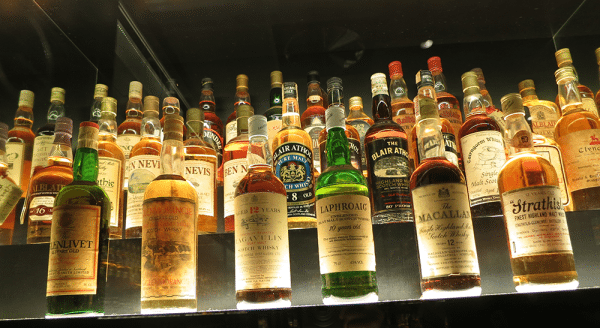 According to whiskey aficionado Leo Robitschek, bar manager at NYC’s The Nomad, “I’ve had some whiskeys with crazy age, and I don’t always find them delightful. The Cragganmore 13-year is every bit as good as a whiskey that’s been aged 25 years. And American whiskeys in particular age much quicker.” Whiskey is also personal preference so dabble in a few varieties to find your own rhythm.